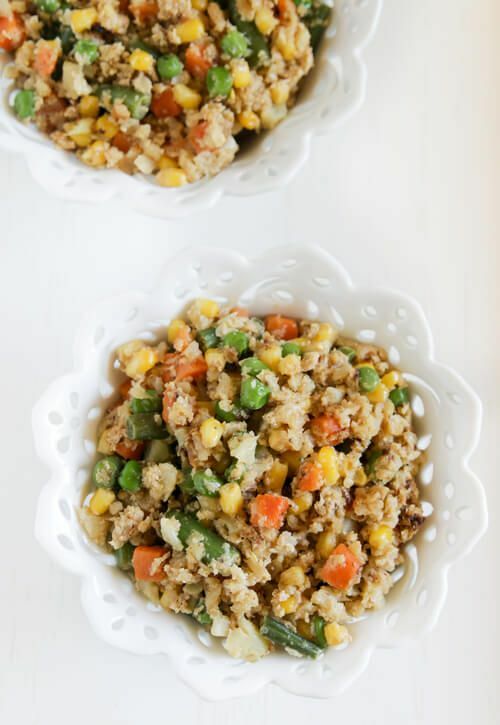 If you crave fried rice, try this recipe for cauliflower fried rice with mixed vegetables—it’s a delicious and healthy alternative to white rice. I actually remember my mom making cauliflower fried rice when I was growing up. Because my mom worked when I was growing up, simple meals like this were a must. Back then, I wasn’t too keen on how the cauliflower smelled while she was sautéing it, but I always liked how it tasted afterward. Now, of course, I associate that smell with a wholesome, healthy vegetable, so I actually like it. What’s also great about this recipe? Just reheat it in a skillet the next day and it tastes just as good as it did when you first cooked it. Cauliflower is known for is variety of nutrients, minerals, antioxidants and phytochemicals. Like much of the produce, it has cancer fighting sulforaphane, which is a sulfur compound that kills cancer stem cells. Killing cancer stem cells controls the cancer because the tumor growth slows down. Other benefits of cauliflowers sulfoaphane includes boosting heart health, blood pressure and kidney function. Who knew this white vegetable can affect your body so much? Cooked, raw and juiced carrots are a health promoting vegetable too. One of its main health benefits comes from the high vitamin A content. This vitamin improves the immunity in the body, protects the eyes, protect from cancer and heart disease that can be caused by free radical damage. Carrots can help every part of your body! Heat up 2 Tablespoons olive oil in a medium skillet. Add cauliflower; sauté for 3 minutes. Add in vegetables and soy sauce. On low heat cook all together until vegetables are soft.